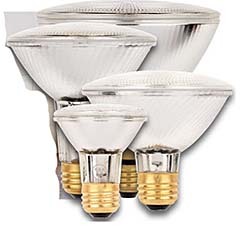 Eco-PAR PLUS halogen reflector lamps are designed to replace older PAR lamps that are no longer in compliance with energy efficiency standards. Lamps are fully dimmable and are instant on. Lamps are available in 38, 60, and 70 watts, and are available in PAR20, PAR30, and PAR38 styles. PAR30 style is available in short-and long-neck versions. Lamps are mercury-free and have an estimated life of more than 2,000 hours.